The Englishwoman’s Review, which published from 1866 to 1910, participated in and recorded a great change in the range of possibilities open to women. The ideal of the magazine was the idea of the emerging emancipated middle-class woman: economic independence from men, choice of occupation, participation in the male enterprises of commerce and government, access to higher education, admittance to the male professions, particularly medicine, and, of course, the power of suffrage equal to that of men. First published in 1979, this twelfth volume contains issues from 1879. 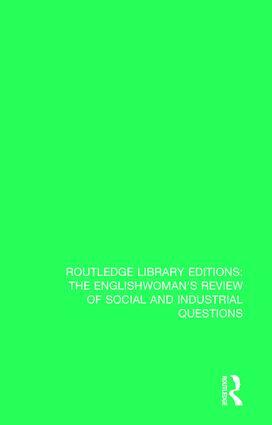 With an informative introduction by Janet Horowitz Murray and Myra Stark, and an index compiled by Anna Clark, this set is an invaluable resource to those studying nineteenth and early twentieth-century feminism and the women’s movement in Britain. First published in 1980, this set of 41 volumes gathers together the entirety of The Englishwoman’s Review from its first to its final issue. In its pages one can trace the growth of women’s professional work in many fields from the beginnings in which a few pioneers achieved success to the eventual establishment of institutions designed to accommodate the numbers who followed in their paths. With an informative introduction by Janet Horowitz Murray and Myra Stark, and an index compiled by Anna Clark, this set will be an invaluable resource to those studying nineteenth and early twentieth-century feminism and the women’s movement in Britain.